And so the Lenca peoples’ defense of their land and the murder of Berta Cáceres are small matters for an organization that declares “a world free of poverty” as its final goal: “you cannot do the work we’re trying to do and not have some of these incidents happen”. What he did not expect was to receive a letter signed by 313 organizations from around the world, contesting these statements and reminding him that “according to the World Bank’s internal policy, the Bank and other financial institutions must ensure respect of human rights in the projects they finance”. Everything points towards a carefully planned repression, and not a few isolated incidents. In late June, a Honduran soldier leaked a list of militants “to be eliminated”. On July 10th Lesbia Yaneth, mother of three and also a member of the COPINH, was assassinated. Over the course of the last decade, the number of environmental activists from this small country who have met the same fate has risen to 114. Before Cáceres’ murder there were 33 instances of death threats against activists who opposed the Agua Zarca project in the Gualcarque river. Since then, five activists who had publicly opposed this project have been killed. Bertha Zúñiga seriously doubts that government authorities can play a role in stopping the violence against indigenous communities: “The authorities keep repeating the same negligent and inept actions that led to the murder of Berta Cáceres. They keep showing no political will towards defending activists. To this day, they haven’t enacted the precautionary measures recommended by the CIDH after the murder of the general coordinator of our organization”. These days, after several months have passed, Bertha Zúñiga reflects on the depth of these connections: “the oligarchic groups have great influence, they mobilize the army to repress people. We should point out that since the 2009 coup many military people have become shareholders in extractive industry projects (hydroelectric, mining, and others). But the corrupt mafias also allow for the organization of criminal groups that work in coordination with major corporations, like this case of DESA-Agua Zarca”. On October 14th, the vice-minister of the State Secretary of Natural Resources and the Environment, Dario Cardona Valle, was arrested due to irregularities in the environmental license granted to the Agua Zarca hydroelectric project in 2013. But Zúñiga questions the limits of the ongoing investigations: “The arrests that have taken place up to now are just a smokescreen to create some sense of justice, but still no measures have been taken against the DESA company which was directly implicated in the murder of Berta Cáceres. If this is what happens in such a high profile case, what should we expect from all the other episodes that COPINH and its members have faced for years? Quite the opposite of justice, since state agents have played their part in the harassment, repression and even assassinations”. Her testimony and warnings should move us to create a far-reaching, international solidarity movement with the indigenous communities, the Honduran people and their struggle. The Principle of Mercy: World Bank President Jim Yong Kim speech at the Union Theological Seminary, New York City, April 6th 2016. Interview with the author, October 15th 2016. “Los hallazgos del Ministerio Público sobre el asesinato de Berta Cáceres son insuficientes”, Centro por la Justicia y el derecho internacional, May 11th 2016. * Alex Anfruns is a lecturer, journalist and editor-in-chief of independent media outlet Investig’Action in Brussels. In 2007 he helped direct the documentary “Palestina, la verdad asediada. Voces por la paz” (available with catalan, spanish, english and arabic subtitles). Between 2009 and 2014 he made several trips to Egypt and the occupied Palestinian territories. He has edited the monthly Journal de Notre Amérique since 2015. 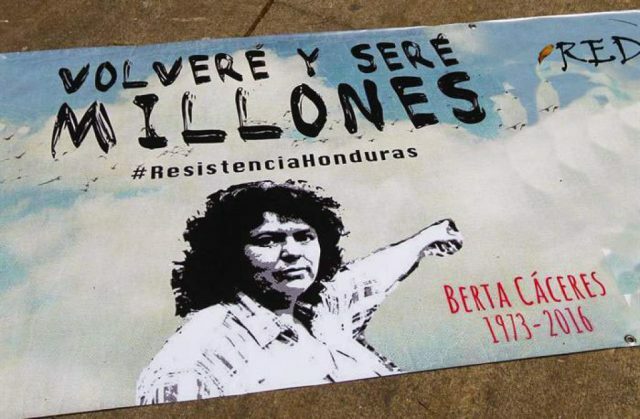 Environmental activists in Honduras refuse to submit A year after Cáceres assassination, US policy on Honduras yet to change Corporations take aim at the heart of Venezuela’s economy Venezuela: Does the opposition want a remake of the coup against Allende?